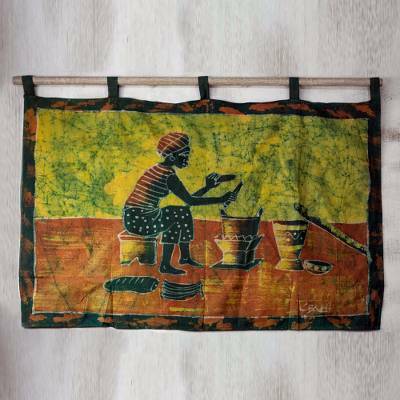 Batik wall hanging, "Fufui Beih"
Steam rises from the simmering pot of ufui beih (meaning yams, cassava, and green plantain) filling the air with the tantalizing aroma of cooking food. She bends over the stove, adding mysterious spices and stirring the ingredients slowly. K. Baka is inspired by his rich Ghanaian culture and recreates the preparation of this traditional meal with batik on 100% cotton cloth. This charming wall hanging evokes the warmth and familiarity of the family kitchen.